St. Vincent and the Grenadines is an independent member of the British Commonwealth. Some of its islands are very popular with the rich and famous; namely, Mustique, Palm Island and Union Island. The multi-island state has lush mountains, amazing rainforests, an active volcano, and beautiful sandy beaches. The average price for properties in the islands is US$2,300 per square meter (sq. m.), according to Global Property Guide research. Foreigners need to acquire an Alien Land Holding License before buying property. Yields are around 3.9% for properties in coastal areas, the centre of the rental market, according to Global Property Guide research. Rents are predominantly seasonal, but these figures are for long-term rentals. Rental Income: Nonresidents’ gross rental income is taxed at a flat rate of 10%, withheld by the tenant. Capital Gains: Capital gains realized from selling real property are not taxed. Residents: Residents are liable to tax on worldwide income at progressive rates. Roundtrip transaction costs, i.e. the total costs of buying and selling a property, are around 15.75% to 25.25% of the property value. The buyer and the seller equally share the 10% stamp duty. 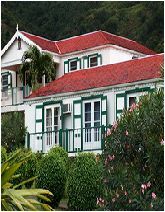 The law in St. Vincent and the Grenadines generously protects the tenant. Rent: Initial rents can be freely determined between landlord and tenant. It is costly to take a tenant to Court to try to recover rent arrears, and time consuming. Tenant Security: It is extremely difficult to evict tenants even though the tenant may be paying rent very sporadically or may have ceased to pay rent entirely. The usual practice is that the tenant gives at least two (2) weeks to one (1) month’s notice. Agriculture, banana production in particular, is still the major industry. When the European Union phased out the preferential access of former colonies to the EU in 1999, economic diversification became essential. St. Vincent and the Grenadines’ tourism industry developed well and is the Islands’ main source of foreign exchange. The number of visitors increased by 3.8% per year from 1999 to 2002. The economy grew by 3.2% p.a. from 2000 to 2005. Growth of 4.2% is forecast for 2006.